Custom Waterfall Wood Countertops, also known as Pastore™ counters, can be designed for use anywhere in the home. 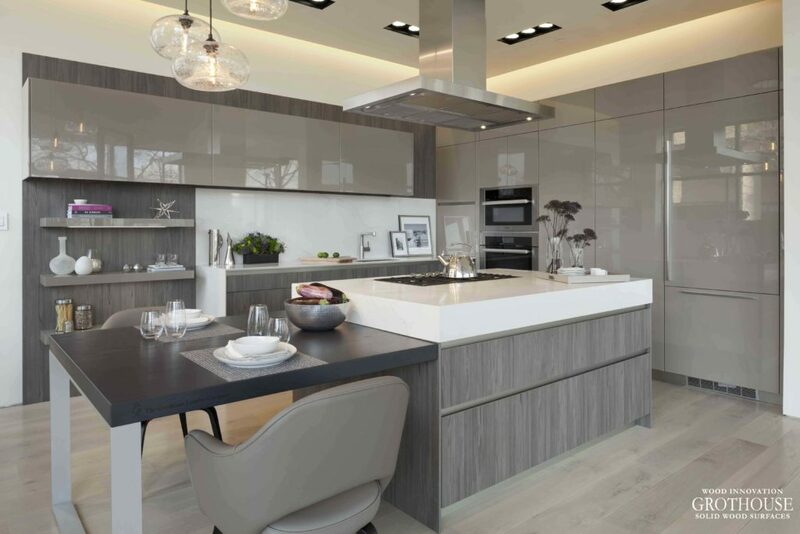 Most luxury designers choose to use them as a kitchen island, while some use them as a peninsula or bar top. 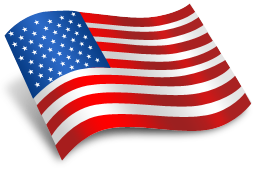 Zebrawood is one of the most popular wood species designers use for waterfall countertops. This is because the wood grain naturally exhibits strikingly beautiful and exotic lines and striations. 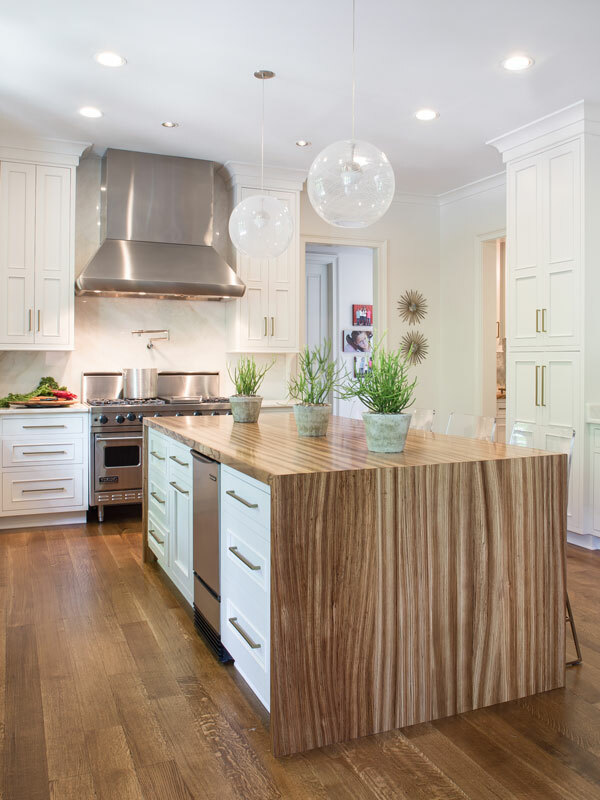 Karen Kassen, CMKBD, ASID, of Kitchens Unlimited designed a Zebrawood waterfall counter for the kitchen island, offering plenty of food prep space and room for seating. 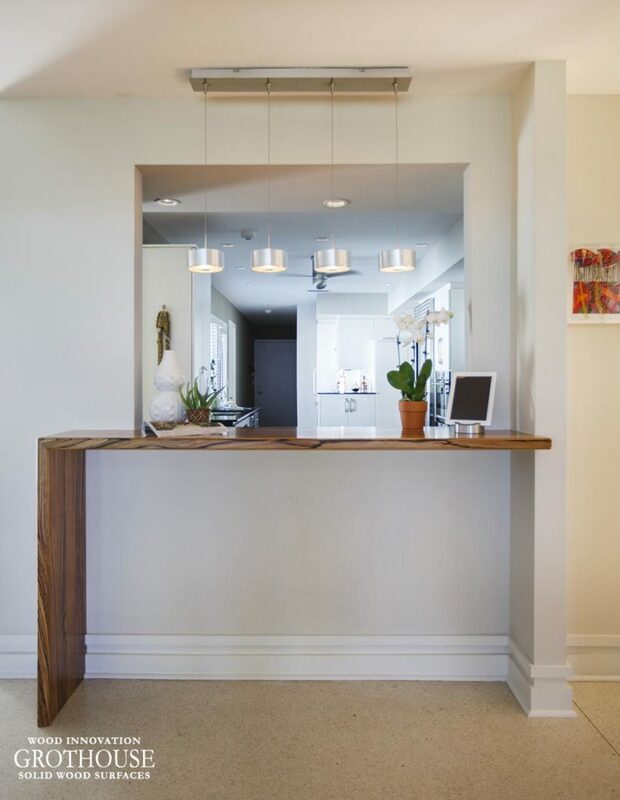 Neena Corbin Kitchens Inc. designed a Zebrawood waterfall bar top to serve as a divider between an entry way and kitchen. 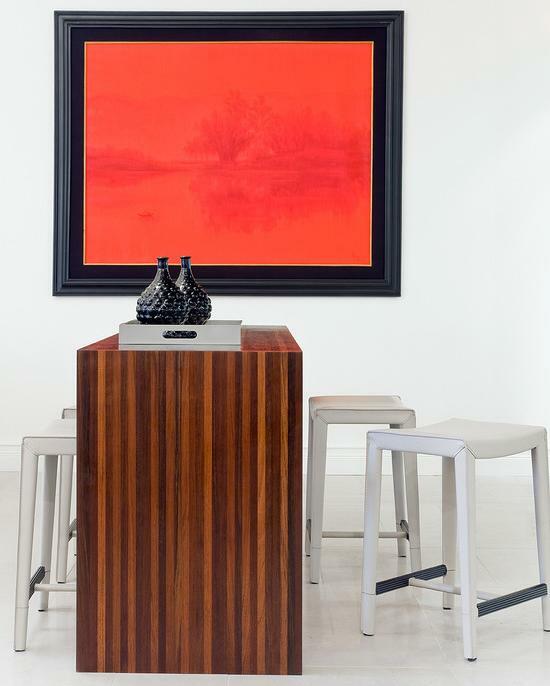 The bar top adds warmth and visual interest to this otherwise white space. 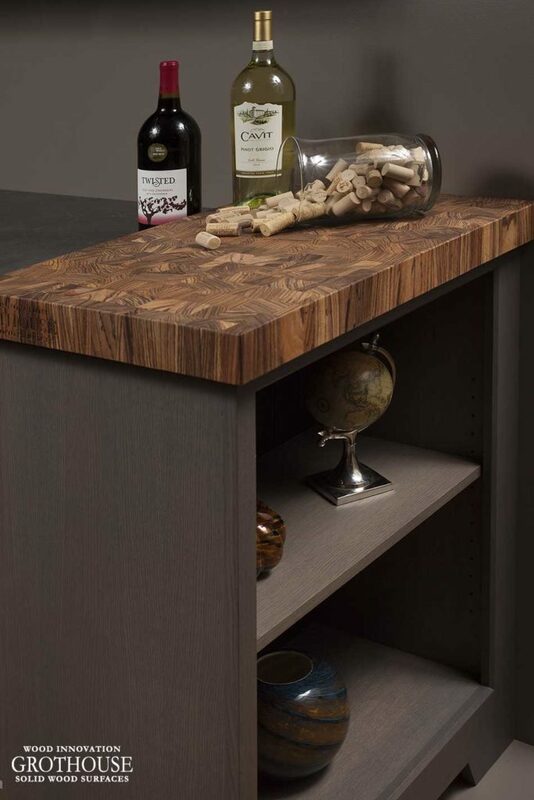 Zebrawood Waterfall Bar Top designed by Neena Corbin Kitchens Inc.
Another popular wood choice for waterfall countertops is Walnut. For KBIS 2017, Wellborn Cabinet designed an American Black Walnut wood waterfall countertop for their modern display. Serving as a peninsula, the countertop also camouflages extra storage cabinets. Paul Bentham of Jennifer Gilmer Kitchen & Bath designed two Wenge waterfall wood tops, one for use as the bathroom vanity top and one for use as a bench seat. The mirror frame was also crafted out of Wenge wood for a uniform look in this contemporary master bath. 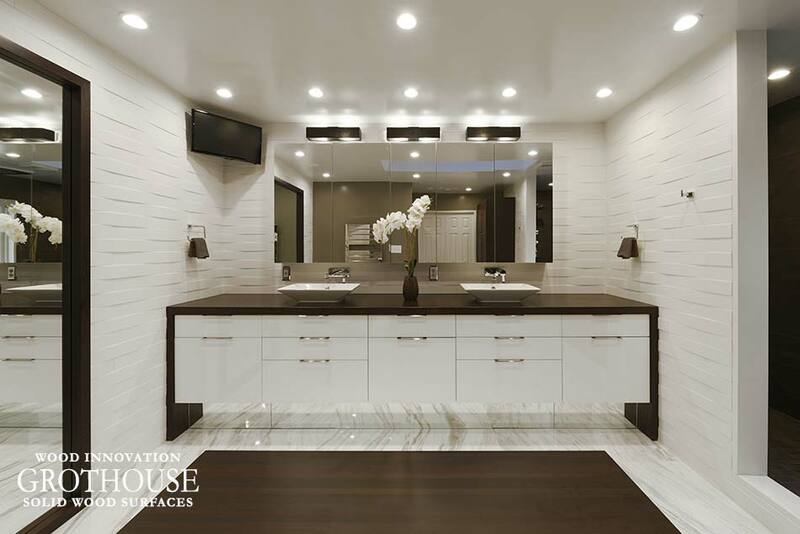 If you would like to see more designs featuring waterfall wood countertops, be sure to visit the Grothouse Countertop Image Library on our website. For daily design inspiration, follow @grothouseinc on Instagram! 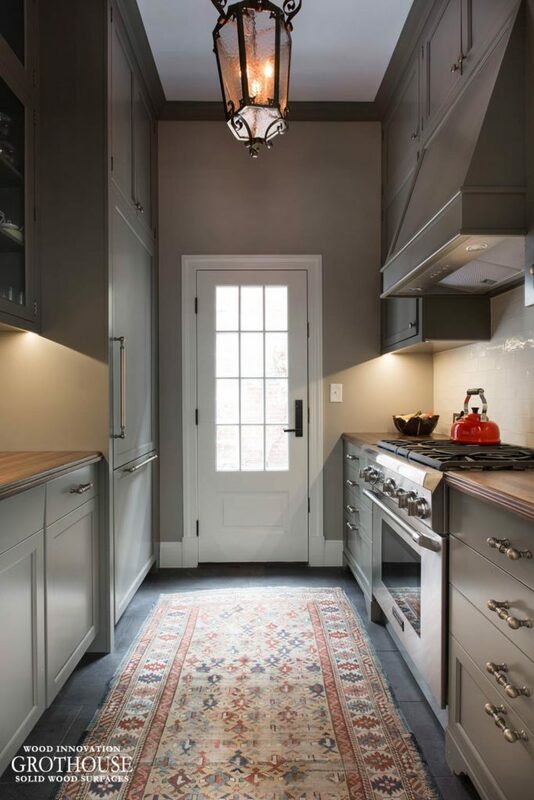 Gray cabinets in kitchens are nothing short of classic, elegant, and timeless – no matter the kitchen style. To keep gray from looking too dreary, designers often pair the cabinets with a warm material like a wood countertop or butcher block. 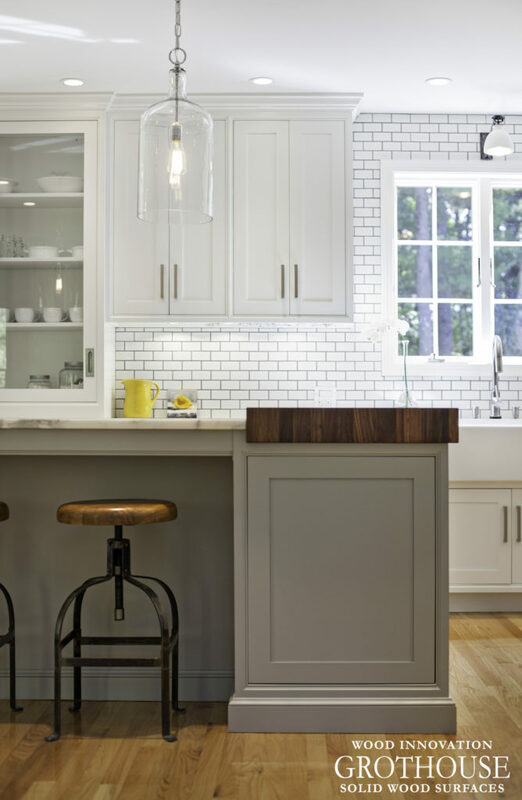 Wood countertops and butcher blocks add warmth and texture to the cool tones of gray kitchens. Shawna Dillon of Studio Snaidero D.C. Metro designed this award-winning modern kitchen with glossy cabinets. Awarded Showroom of the Year 2016 by Kitchen & Bath Business magazine, this kitchen exudes a sense of sophistication and glamour. 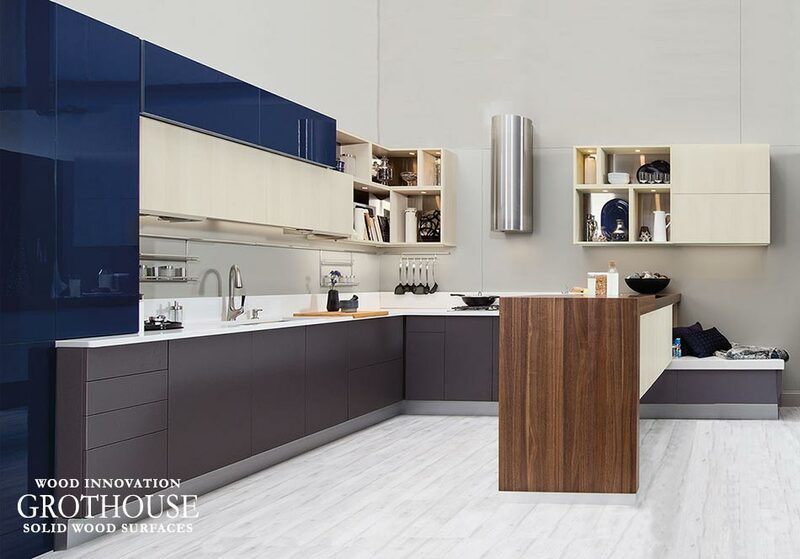 The kitchen island features a Stained Ash wood countertop, crafted to exhibit a simple and sleek look. 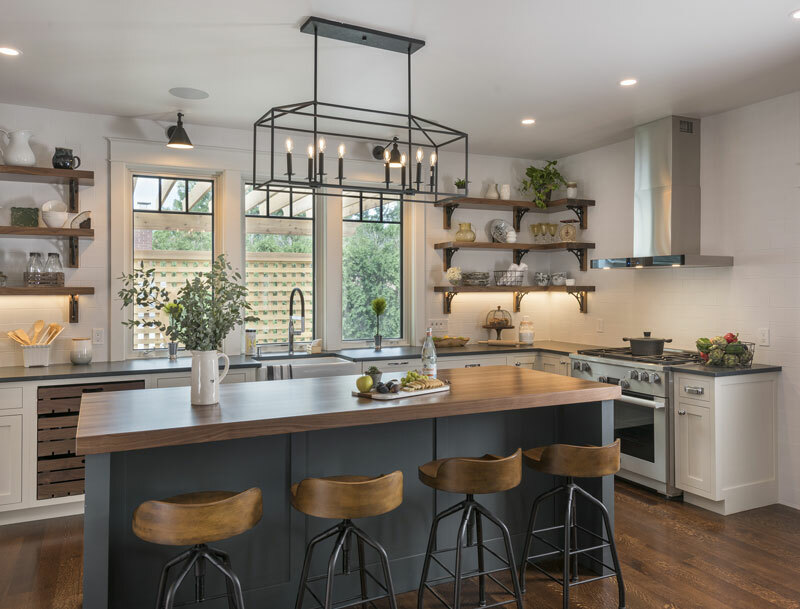 A custom distressed Walnut countertop brings warmth to this small gray kitchen designed by Stefan Hurray of Architect Design. The countertops feature a Standard Roman Ogee edge profile finished in a hand rubbed black glaze. Wood-Mode designed a Saxon Wood™ countertop to grace the gray cabinetry in this mudroom space. The dark streaks in the wood compliment the dark gray color of the cabinets, while the lighter tones provide warmth and comfort. A Zebrawood Butcher Block sits perfectly on this gray cabinet with open shelving. Lisa Martin of Signature Custom Cabinetry designed this display for the 2015 Signature Custom Cabinetry Conference. 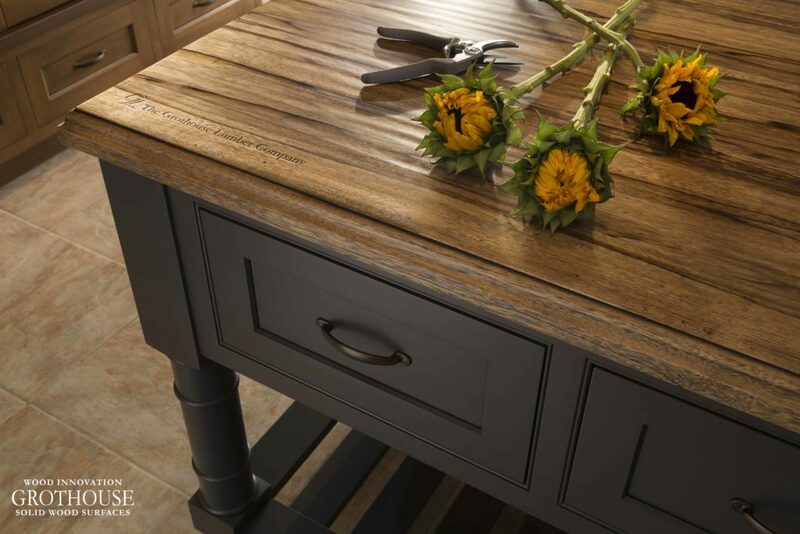 The dark gray mixed with warm wood tones create an intricate appeal. Karen Swanson of New England Design Works added a Walnut butcher block to the light gray kitchen island in this modern farmhouse kitchen. Adding warmth to the kitchen, the butcher block also provides a food preparation work space. 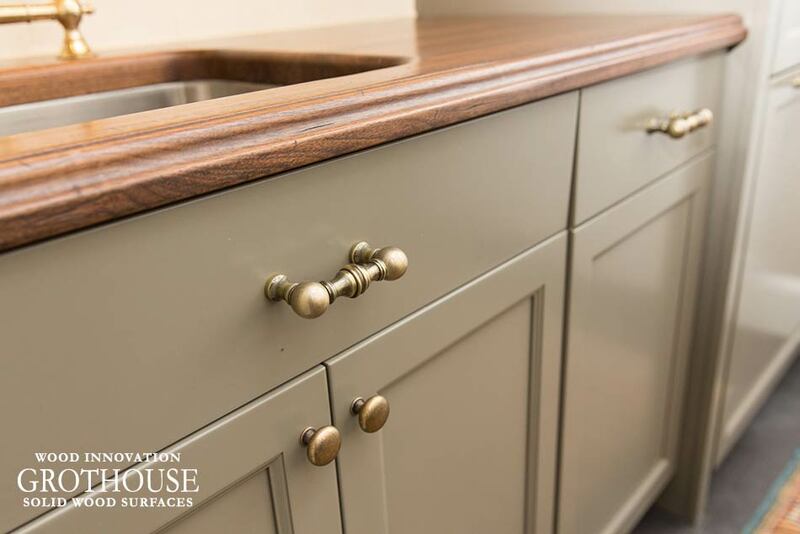 To see more designs with wood countertops and gray cabinets, visit our Countertop Image Library.